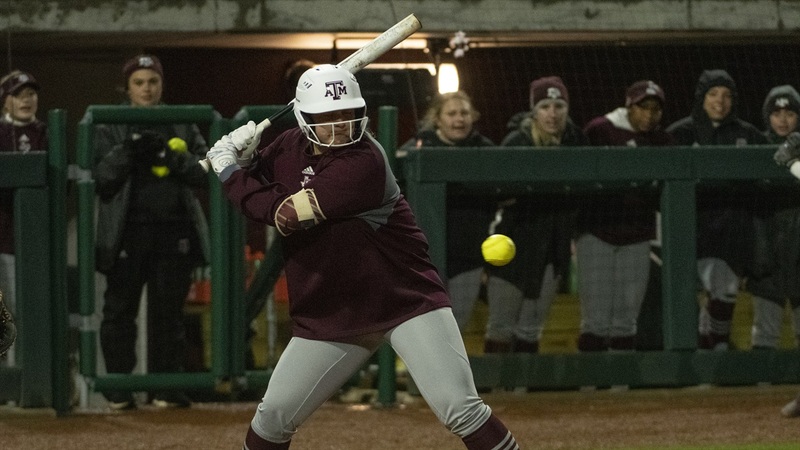 The Aggie softball team (2-0) once again found their groove early and defeated the Northern Colorado Bears 18-0 for their second run-rule win of the day. This was the Aggies’ second game of the day as part of the Aggie Classic hosted at Davis Diamond. The A&M bats started hot and did not cool down as the game wore on. Riley Sartain sent two balls over the fence in the game and got the Aggies’ run production going. Sartain’s two-run home run in the first started off what would become a beatdown of Northern Colorado. A defensive error would add another run in the first. The second inning would see the Aggies plate another five runs, powered by singles by both Meagan Smith and Kelbi Fortenberry. Sartain continued her hot streak and had a two-run double to add to lead, making the score 8-0 heading at the end of three. Sartain would finish the game 4-4, and finish with two home runs and six RBI. Though the Aggies did not plate a run in the third inning, they did not let off the gas going into the fourth. They would record nine runs before recording a second out in the inning. A second Sartain home run and hits by Morgan Smith, Gabby Moreno, and Kayla Garcia added 10 more runs to the A&M lead in the bottom of the fourth. Aggie pitcher Kayla Poytner got her first start of the season and did not disappoint. She pitched 4 innings, allowed only 2 hits and did not allow a run to score. Hannah Mayo came in to close the door allowing only 2 runs in the fifth, as the Aggies sealed the second run-rule victory of the day. The Aggies will look to continue their dominance in the season-opening tournament as they host another doubleheader tomorrow at Davis Diamond. A rematch of today’s second game will be at 12:15 pm, with game two against UNT, slated for 3:00 PM. Both games will be streamed on SEC Network+.